Answering the call of nature while camping can be troublesome to say the least. Stripping down behind the largest tree trunk you can find and holding the squat position for what feels like an eternity, is not the most convenient nor ethical method. Cue an essential piece of gear, the Toilet Tent (aka privacy shelter), providing a solution for this ever present problem, especially among large groups or families. You can forget those long walks to the campsites facilities, which aren’t the most hygienic places in the world, lets be honest. 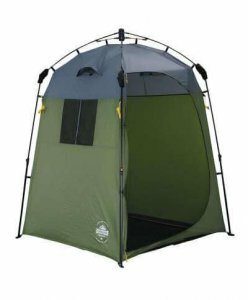 Now its possible to set up your own personal shelter, which is easy to pitch, waterproof and has plenty of space to use your own camping toilet. We will review and compare the top brands on the market, considering criteria such as price, assembly, features and size. There are 1 room and 2 room versions to choose from, this will depend mainly on group size. If you need a utility room for storage, to get changed or to double as a shower room, we strongly suggest a 2 room model. You will probably expect this to be feature-full and you won’t be disappointed either. 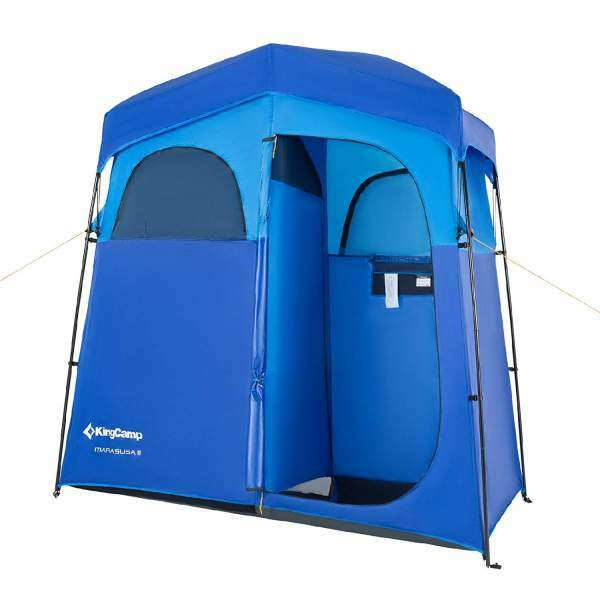 A 2 roomed toilet tent that has excellent value as it comes with a free 5 gallon solar shower, but more importantly, the strength to support one. A durable tent that can withstand the elements and set up in no time, what more do you need. Well let’s find out. The fabric is made of thick polyester, which is great against scuffs and abrasions, it won’t tear easily and is water resistant. Secondly, the frame is made of steel, although heavier than other toilet tents, it’s far more durable. 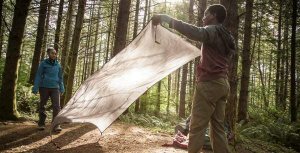 A free rainfly which simply attaches on to the roof of the tent, which aids in protection during heavy rain. The rooftop has a meshed fabric keeping the tent well circulated. Materials used in manufacturing the tent are aluminum coated, giving full privacy as a non-transparent fabric. The measurements are around 7 x 3.5 in feet for length and width respectively which is equal to most of the top models. The center height is very generous with a 7 foot height and provides a more spacious feel when inside. Another 2 room model from a very reputable brand. One of the best sellers in the toilet tent range because of its economical price and aesthetic design. In a choice of 3 colors, attachable rain fly and anti-UV technology it’s a winner. Let’s see what else it offers. A pop up tent designed with an automatic rod bracket, which only needs to be pulled outwards, extended and it clicks into place. A very easy set up method which takes around 3-4 minutes to set up and stake down. The poles are aluminum leg poles which are strong, but the frame is a fiberglass frame, keeping it lightweight. It’s 100% waterproof with an attachable cover, to stop the raining entering from above. The material is made from Oxford Fabric which has been silver coated, this means that’s it’s protected from the Sun’s rays, protecting you and family from UV. A vented rooftop, allows hot air to circulate and keep the interior condensation free, much like the inflatable tents from Vango. It also has a nice draining feature if you ever need to use this as a shower tent, its ready. With a four sided water outlet on each side allowing the water to escape every which way. A premium model with an insane level of protection, the highest waterproof rating on our list. The toilet tent from Khyam has a hydrostatic head rating of 5000mm, which is what we would expect to see in an extreme backpacking tent. This could keep you dry during heavy rainfall, offering a nice space to hide or take shelter. It has 2 other features which make it perfect for backpacking. The assembly is fast, it involves a RapidexTM quick pitch system which works much like the instant tents. Pre-attached framework that is all connected and expands together. The nylon joints allow for continuous movement without vulnerability and the fiberglass framework makes sure its pliable, yet strong and maintains a low weight. Additionally it uses a double polyurethane polyester for the fabric, which is incredibly tough and wont tear with rugged use. The seams are double taped to prevent any weak-points for water penetration. 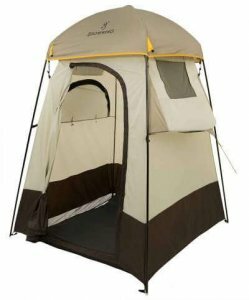 A generous head height of 6.5 feet combined with a total weight of 8 lbs, its the lightweight campers dream choice for utility tent. Kicking things off with a very sleekly designed toilet tent from G4Free. A simple pitch with some quality features making it a great option for your next trip. Engineered with thick wiring, while others are generally elasticated cords. Capable of holding up to 15-20kg for example. Secondly the frame has been coated with an Anti-Rust paint, this will resist weathering better than other frames. A silver interior coating is used, which acts as protective material from the sun. The fabric is also abrasion proof, so it won’t rip or tear easily like some of the cheaper $30 pop ups. It also has a Velcro floor attachment so you can keep your feet off the dirt when using the toilet. When assembled its dimensions are approximately 83 x 47 x 47 in inches, which is a decent head height. When packed away and folded up it will be at a reduced size of 21 x 7 x 7 which is easily stored away in its carry bag and car boot. The removable floor section is a great feature, keeping it enclosed, with no drifting odors. 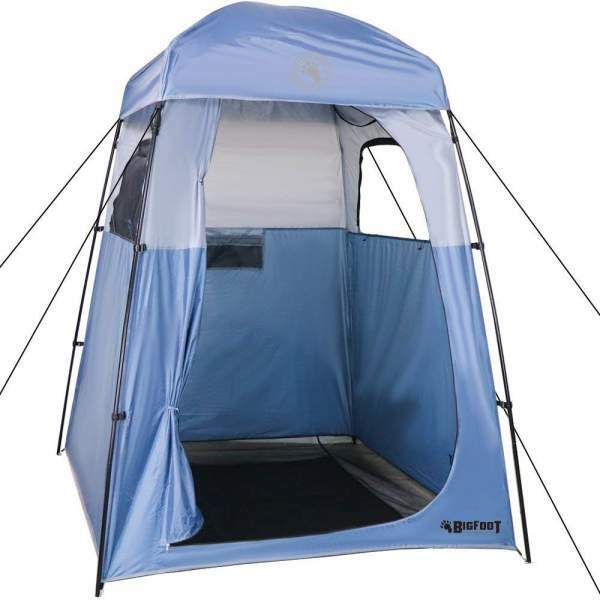 It can also be used as a privacy room or shower tent, with a bit of customization. 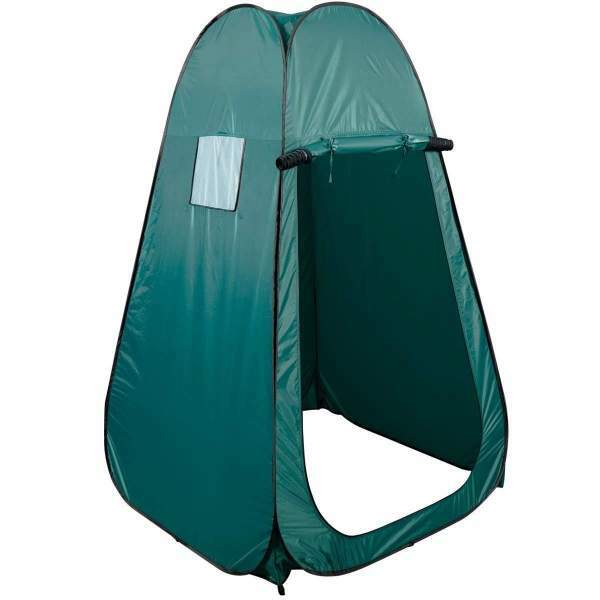 Our next choice in the list is a pop up toilet tent from Super Buy. A best seller in its range, probably due to convenience as it sets up in minutes and is folded away just as easily. Waterproof, lightweight and durable are its key features. Let’s find out more. The material is high quality, this is why the price is higher than similar models. This isn’t necessarily a negative, the $30 pop ups are usually the ones to last a day, or rip on the first use. The fabric is made of a 190T Polyester PE, which is tough and durable. They’ve additionally applied a waterproof coating for added protection. An integrated window sits within one of the side panels and it is meshed. Providing ventilation and will allow any unpleasant odors to escape quickly. Air circulation is key when considering a toilet tent, due to the nature of its use. It’s not the largest toilet tent on the market, however the easy set up and fast pitching method makes it a great choice for many different scenarios. 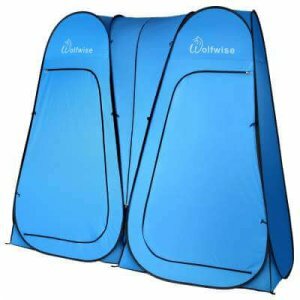 Can be used as a changing/privacy room at your campsite to change clothes after a long hike, or on the beach etc. Pop Ups generally aren’t as stable as fixed frames. Aptly named ‘Oversized’ it is insanely spacious inside and for this reason can be used for a variety of purposes. 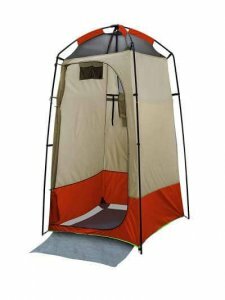 With a tall center height, lots of storage options and ceiling attachments it makes for a multi-purpose toilet tent. With a spacious interior, easily enough space for 2 people. You can fit a portable chemical toilet inside and still have space to move around, with plenty of room for changing even with a toilet set up. It’s not a pop up, however the set up isn’t difficult, it follows an easy 8 step process from bag to pitch and can still be done within 5 minutes. As it has fiberglass poles it’s easily carried and lightweight. Inside, the ceiling has a hook attachment, which makes it compatible with most camping showers. The material is 190T Polyester Taffeta which is a waterproof material employing a 2000mm waterproof index rating. A large tent as we mentioned with a 7.2 foot center height to be exact. The weight is a mere 8 lbs. which can be easily carried within a bag or over your shoulder. It packs down to a small size also at 24 x 7 x 5 inches, so it won’t take up much space when included in your camping inventory. Set up slightly more demanding than other models. Fiberglass isn’t as strong as steel or aluminum frames. This 2 room from KingCamp is a good option for those needing a larger model. 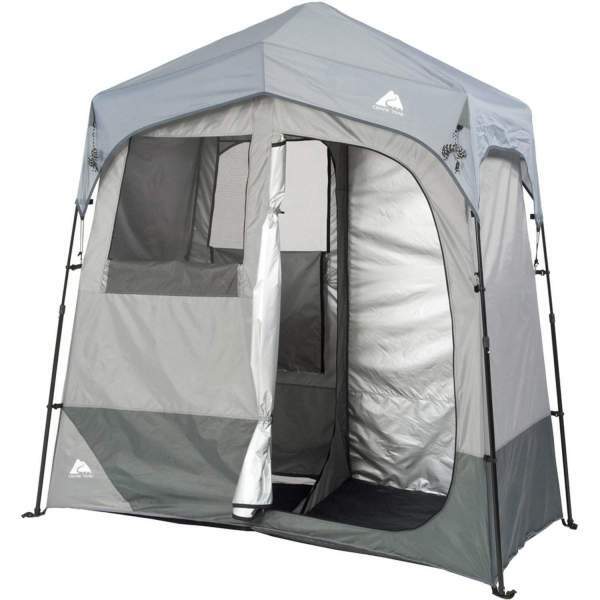 Its single room shower tents are second to none and this larger 2 roomed utility tent is of equal quality. 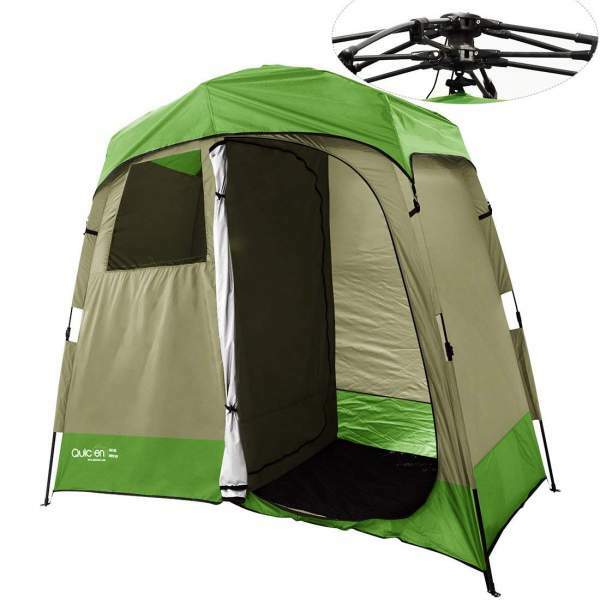 We especially like this model as it comes with a rain fly, spacious double rooms and great protection. Measuring 84 x 42 x 84 in inches, it’s a generously sized toilet tent. There is plenty of head height also with a center height of 6.5 feet, however you may notice this is 0.5 feet lower than CORE’s model. To be honest both of these heights are more than enough for the average camper. It’s a free standing toilet tent that can be pivoted and moved around after assembly to preferred position. You can also tie it down when necessary with stakes and guy lines to secure it safely. Lightweight as it uses fiberglass poles for its structure, yet still strong, able to hold up to 20kg in weight before bending. Our favorite feature is the removable rainfly. Most cheaper models don’t have one, so you need to pitch under a tree for example to cover yourself, here you are free to pitch anywhere. Due to the waterproof rating of 1500mm, this is considerable, protecting you well while on the toilet. A large interior pocket included, that has 4 different compartments. This allows you to store multiple smaller items without them mixing them up and weighing the tent down in 1 place. Distributing the weight, allowing you to store heavier items. There is also 2 lines to hang wet clothes and towels. A simplistic and proven waterproof toilet tent here from Cleanwaste. A modern design which quickly pitches, due to its snap assembly poles and easy bend hinges, this model can be set up on your own in under 60 seconds, with ease. Ventilated well due to its screened windows, it has 3 integrated in total and can be opened up to clear out any unwanted odors. There is an attachment inside for a hose or camping lantern, which is very convenient during night trips to the toilet. Secondly there are various storage pockets to hold condiments, tissue etc. A spacious model with a huge zippered door on the front and stands tall at 6.6 foot for head height. It folds down pretty small as well, at 28 x 6, so its easily stored away after use. For security they have designed 3 flaps on the base of the model which provides additional anchor or stake points to tie down the tent, which will bode well in high winds. This dual roomed, pop privacy tent is an excellent choice for large groups, due to its versatility and features. You could potentially have male and female compartments for 2 toilet rooms or a changing room combo. A robust steel frame keeps it steady in strong winds and the 190T polyester keeps it dry during rainfall, perfect protection for outdoor enclosures. Additionally there are 6 ropes you can anchor to the ground, to keep it secured. Protection not only stems from the poly taffeta material, but also the DWR coating that prevents water penetration and the silver coating that provides UV defense and block visibility. Circulation is present with the zippered window and they have some storage pouches internally, with a hang-line to dry your clothes or hang hand towels etc. Measuring up at 95 x 47 x 75 combined, they can actually be unzipped and separated as 2 single tents, if you want them spaced apart, or together for convenience, you can choose. The aptly named Stinky Pete is a well designed toilet tent that has robust steel frame and a tall center height, creating a pleasant and spacious environment to answer the call of nature. It has a drainage feature in case you wanted to attach a shower bag, in which case it can hold a 3 gallon, tops. There are plenty of neat little storage features, such as the nylon strap which acts as a clothes line. There is also 2 generously sized pockets for storing tissue, wipes etc. The ventilation is good, due to the large door in a D shape and an equally sized window on the side panel which provides air circulation. Measuring at 4 x 4 square feet for the base it also has a huge 90 inch head height. Everything needed for assembly is included and it stores nicely in its free portable bag. The frame is decent, mainly made up of fiberglass, which is lightweight but not so strong. To fortify, they have included steel poles for the uprights, to strengthen the framework. Storage features are included in the form of a side shelf and storage pockets, additionally the storage pockets are meshed. This is useful to stop water pools forming in the corners, if being used as a shower tent for example. A detachable floor is included also, which is handy when used with your camping toilets, to provide a sealed base. Vents are integrated to provide air circulation, clearing any odors easily and swiftly. All ropes and stakes are included and a free carry bag is thrown in to add some value. Shorted than the Gigatent model, but wider with more depth, so will naturally be more sturdy. One of the tallest models in our list, standing at 7.2 feet, it towers above most other brands. A simple set up with easy to follow instructions and a very competitive price, makes this a good choice for small groups. Steel poles throughout give it a weighty, yet sturdy frame, so it will hold up well in winds. 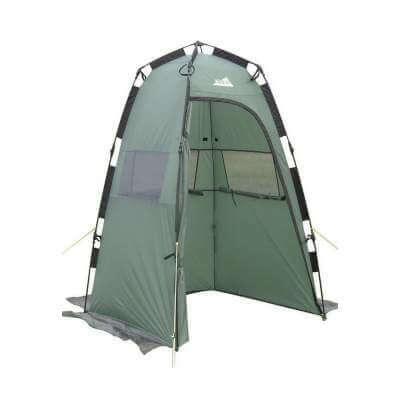 A versatile tent that can work as a shower tent, given the attachment for portable shower and robust frame. However, with the option to unroll a floor and with good ventilation, it makes a better toilet tent. Easy access provided by the zippered door, when inside there are wall pockets available as storage to keep your bathroom things off the damp ground. With the pointed roof it also provides a good runoff for rainfall, so it wont accumulate on the top of the tent, penetrating or weighing it down. An excellently made pop up tent suitable for camping toilet use. Single room design, however with very spacious dimensions at 5 x 5 x 7 feet, large enough to fit even a 5 gallon chemical toilet. One of the few models in our list with an instant pitch, making it very convenient at the campsite, you can be pitched and secured within a few minutes. Quality level sun and rain protection due to the PU coating on the tent fabric. The 190T polyester reaches 1500mm in water column, which will hold up well in moderate rainfall. 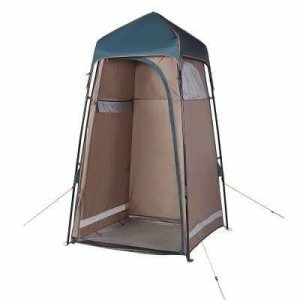 It’s versatile given the removable mesh floor, which utilizes hooks to attach to the base, providing an adequate set up for a changing room and shower tent alike. The interior has storage in the form of 2 pockets, towel holder and an attachable mesh shelf, which stops water accumulating on top. 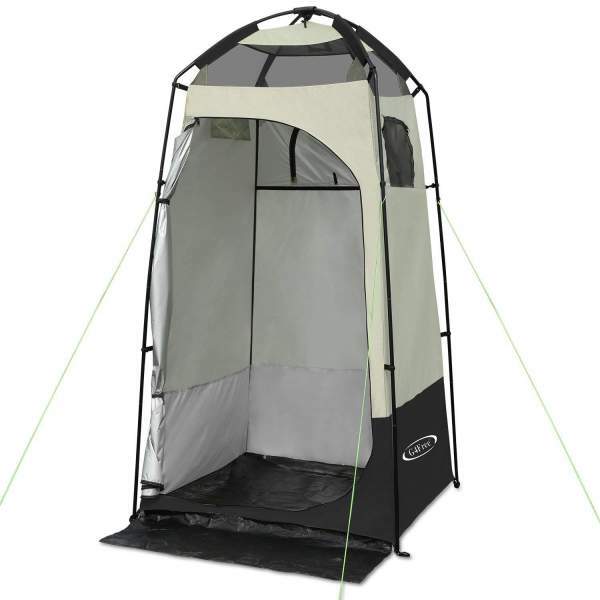 Additionally it makes an impressive shower tent, due to its privacy curtain, meshed floor and portable shower attachments. What is a Toilet Tent? A toilet tent or privacy shelter is a 1 or 2 roomed tent that can be used in conjunction with a portable camping toilet. Offering a convenient way to use the bathroom, that is also right beside your camp. Usually manufactured with preference to ventilation for clearing odors, spacious rooms for the toilet and maneuvering and waterproof/visibility protection. This creates a homely experience when going to the bathroom and also keeps you away from any unpleasant toilet experiences often endured at busy campsite facilities. 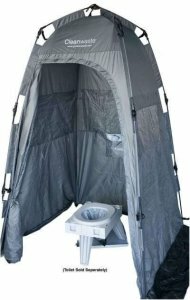 How to Pitch a Toilet Tent? Most of the toilet tents on the market are in pop up format. In this case they are very easy to set up. You just take them out the carry bag or release the strap holding it together. You can then toss it in the air and it will unfold in front of you. Stand it up tall and then position it correctly by pivoting into the right direction. You then secure with tent stakes and guy-lines, much like you would with a canopy or gazebo, for additional stability. How to Fold a Toilet Tent? Ideally you just want to just lay it flat in front of you, pick it up from the bottom end and raise it up. As it comes up you need to grasp each side and bend inwards, this will create a coil, folding each side on top of each other. Forming a disc shape just like in the beginning prior to pitch. Attach the strap or slide into carry bag and you’re done. Simple as that. How to Maintain a Toilet Tent? Firstly, coat it with a waterproofing spray, this will help it to resist any rainfall and damp. Even if they come with a rainfly and waterproof coating already integrated into the fabric. I will always still coat mine, because why wouldn’t you want that option to reinforce your purchase if the choice is there. Secondly, it’s imperative that they are bone dry before putting them back into their carry bags. What tends to happen, if you fold down the tent and store away with wetness still on the fabric, this will turn into mold and mildew, wearing down and eroding the tents fabric. 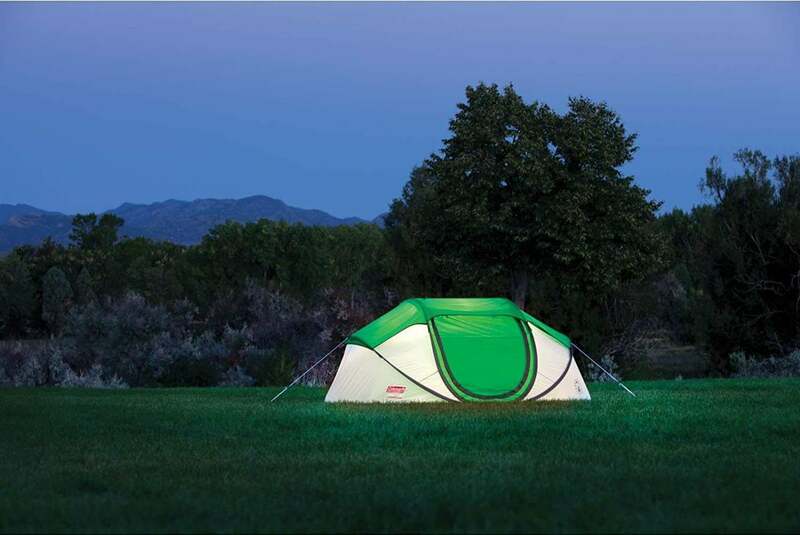 All in all toilet tents or utility tents are a great option for camping trips. Alleviating the annoying tasks of old and providing an easy way to improve hygiene and cleanliness while outdoors. This also allows you to camp off the beaten track, not needing to rely on campsite facilities or pitching beside them so closely. 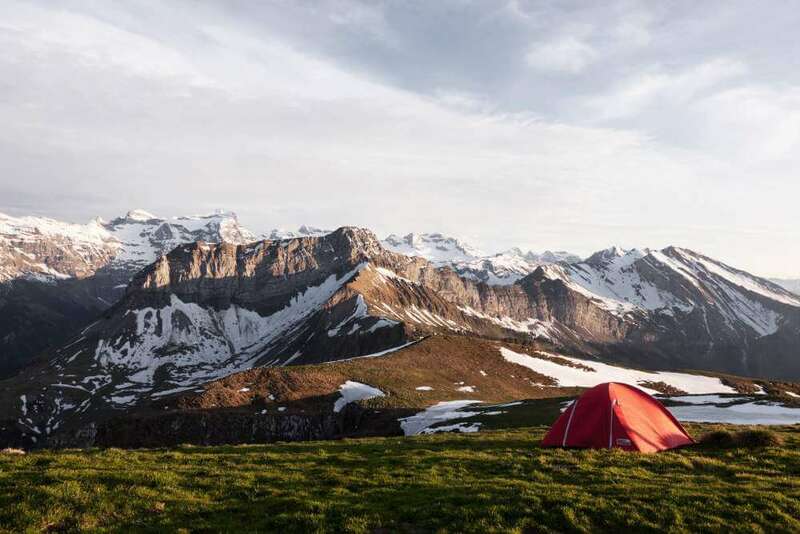 We hope you enjoyed this article and that it will help you make your next camping trip more hygienic and hassle free. Making troublesome outdoor toilet time a thing of the past. If you have any questions feel free to contact us or drop a comment below. See you again soon for our next installment.